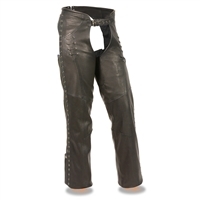 Unisex Double Deep Pocket Insulated Chaps. Plain Milled Cowhide 1.1 - 1.2mm. 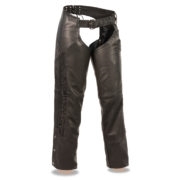 2 extra deep pockets on each thigh, 1 zipper and 1 snap close. Snap-out, high performance insulated liner for extra warmth. Made with Premium Cowhide 1.1-1.2mm Thick Leather. Embroidered Reflective Tribal Design on Thighs. Low-Rise Waist Design with Double Buckle Front. Back Thigh Lacing for a great fit. Adjustable with back waist lace.